Over the last decade, two- and four-year degree requirements for early educators have become common. In 2015, the National Academies of Science, Engineering, and Medicine issued a comprehensive report on the early education workforce, recommending that all lead teachers of young children from birth through age 8 have at least a bachelor’s degree. Currently, fewer than half of all early education and care workers do. In the spring of 2017, the city of Washington D.C announced that workers in the city's licensed childcare centers would be required to have a minimum of an associate’s degree. Degree requirements for early education and care workers have sparked controversy and fierce debate. Supporters point to a solid foundation of evidence on the long-term benefits of early childhood education and to studies showing that professionally trained educators outperform workers with little or no formal training. Critics argue that a college degree—even an associate’s degree—is expensive, time-consuming, and not necessarily effective for imparting teaching skills. Requiring workers who generally make less than $25,000 a year to get a degree can seem almost punitive, particularly those who have been working with children for many years. Asking workers who make so little to spend their time and money getting a college degree that will lead to only marginal changes in their earnings is tough. But failing to build the skills of our early education workforce is self-defeating. 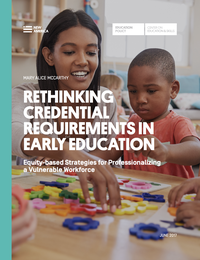 In my paper Re-thinking Credential Requirements in Early Education: Equity-Based Strategies for Professionalizing a Vulnerable Workforce, I explore the debate around degree requirements for early educators and offer up an alternative approach that is more equitable and affordable: apprenticeship. A centuries-old education model that combines paid, on-the-job learning with related classroom instruction, apprentices complete their programs with significant work experience, technical skills, professional networks and, best of all, no student debt. Apprenticeship has its roots in the skilled trades but it is finding increasing acceptance in fields like healthcare, information technology, finance, and even early childhood education. The city of Philadelphia has embarked on a bold experiment to professionalize their early education workforce through apprenticeship. In May, the city launched the ECE Career Pathways Partnership, enrolling 30 current early childhood educators and their employers in a two-year apprenticeship program. Successful apprentices receive a certificate of completion from the U.S. Department of Labor, an associate degree, and lead teacher certification for Philadelphia-area early childhood education centers. The apprentices learn on the job with the help of a worksite mentor and receive college credits as well as their regular wages. They face limited out-of-pocket costs, but they earn progressively higher wages as they advance through the program. Apprenticeships could be a game changer in early education, frontline healthcare, and other fields where a skilled workforce is essential for reaping the rewards of public investment but where wages remain low and working conditions poor. 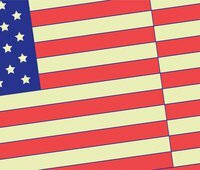 They can also help us move beyond the polarizing debate around college degree requirements. Awareness of how apprenticeship programs are designed and delivered—and how they differ in key respects from traditional higher education programs—can help policymakers identify opportunities to use them to professionalize workers in critical industry sectors.